The Home tab of the GeoPro web app allows you to broadcast a mesasge to all devices on your GeoPro account. 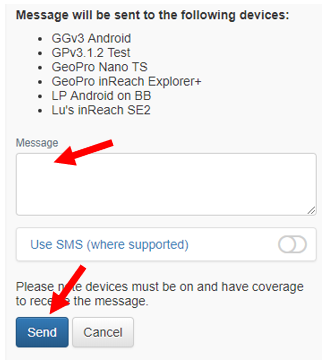 When broadcasting a message, you can send a message to all devices, devices in a specific country, geofence, or define a custom area on the map. Note: Using this function will send a text message to all active devices, even those that are powered off. 1. Navigate to the Home tab and select Send Text Message. 2. Select a Delivery Area Type using the toggles. 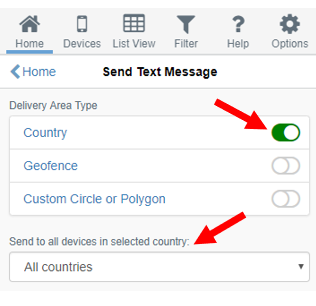 To broadcast a message to devices in a specific country, select Country followed by the desired country in the Send to all devices in selected country drop down. 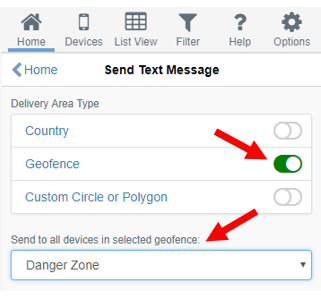 To broadcast a message to devices in a specific geofence, select Geofence followed by the desired geofence in the Send to all devices in selected geofence drop down. 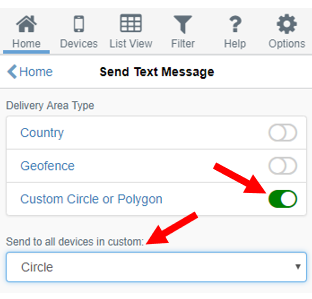 To broadcast a message to devices in a custom defined area on the map, select Custom Circle or Polygon, then select the desired shape you would like to use to draw on the map from the Send to all devices in custom drop down. Draw on the map to define your message area and resize as necessary. 3. Enter the desired text you would like to broadcast (up to 160 characters) and press Send. 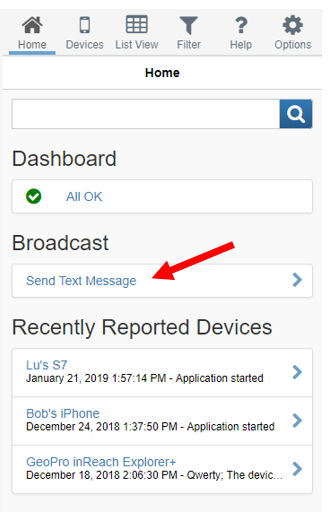 Note: Only devices capable of receiving text messages will receive the message and a list of all recipient devices will be displayed.